One of the most powerful mid-level ships in the Galactic Civil War, the MC30C frigate presented a lethal combination of speed, high-powered armament, and advanced deflector shields. 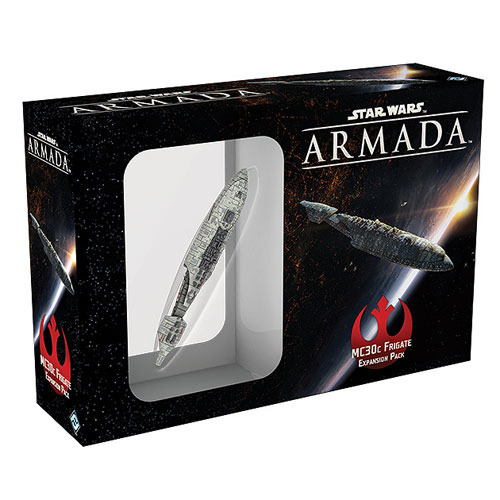 Now this fast and nimble rebel ship arrives to Star Wars Armada in the Star Wars Armada MC30C Frigate Expansion Pack, as a small-size vessel that can fire as many as 5 attack dice from it's left and right hull zones. You'll also find 2 command dials, ten upgrade cards, and all the tokens you need to bring this Rebel ship to battle. Ages 14 and up. Please note: This is not a complete game experience. A copy of the Star Wars Armada Game Core Set is required to play.